Functional group of an alcohol molecule. The carbon atom is attached to other carbon or hydrogen atoms. In chemistry, an alcohol is any organic compound in which a hydroxyl group (-OH) is bound to a carbon atom of an alkyl or substituted alkyl group. The general formula for a simple acyclic alcohol is CnH2n+1OH. Generally, the word alcohol usually refers to ethanol, also known as grain alcohol or (older) spirits of wine. Ethanol is a very strong smelling, colorless, volatile liquid formed by the fermentation of sugars. It also often refers to any beverage that contains ethanol (see alcoholic beverage). It is the most widely used depressant in the world, and has been for thousands of years. This sense underlies the term alcoholism (addiction to alcohol). Other forms of alcohol are usually described with a clarifying adjective, as in isopropyl alcohol (propan-2-ol) or wood alcohol (methyl alcohol, or methanol). The suffix -ol appears in the "official" IUPAC chemical name of all alcohols. The simplest and most commonly used alcohols are methanol (common name methyl alcohol), with the formula CH3OH, and ethanol (ethyl alcohol), with the formula CH3CH2OH. Methanol was formerly obtained by the distillation of wood and called "wood alcohol." It is now a cheap commodity, produced by the reaction of carbon monoxide and hydrogen under high pressure. In common usage, "alcohol" often refers to ethanol or "grain alcohol." Methylated spirits ("Meths"), also called "surgical spirits" or "denatured alcohol," is a form of ethanol rendered undrinkable by the addition of methanol. Aside from its primary use in alcoholic beverages, ethanol is also used as a highly controlled industrial solvent and raw material. The word "alcohol" almost certainly comes from the Arabic language (the "al-" prefix being the Arabic definite article); however, the precise origin is unclear. The Persian physician and scientist Rhazes (ca. 865 – 925) discovered this substance, but because he wanted his book to be published in most of the then-known world, he used the Arabic language instead of Persian (although he made copies in Persian). The word was introduced into Europe, together with the art of distillation and the substance itself, around the twelfth century by various European authors who translated and popularized the discoveries of Islamic and Persian alchemists. A popular theory, found in many dictionaries, is that it comes from الكحل al-kuḥl, originally the name of very finely powdered antimony sulfide Sb2S3 used as an antiseptic and eyeliner. The powder is prepared by sublimation of the natural mineral stibnite in a closed vessel. According to this theory, the meaning of alkuhul would have been first extended to distilled substances in general, and then narrowed to ethanol. This conjectured etymology has been circulating in England since at least 1672 (Oxford English Dictionary). is also the origin of the English word "ghoul," and the name of the star Algol. This derivation would, of course, be consistent with the use of "spirit" or "spirit of wine" as synonymous of "alcohol" in most Western languages. According to the second theory, the popular etymology and the spelling "alcohol" would not be due to generalization of the meaning of al-kuḥl, but rather to Western alchemists and authors confusing the two words al-kuḥl and al-ghawl, which have indeed been transliterated in many different and overlapping ways. Common names for alcohols usually start with the name of the corresponding alkyl group followed by the word "alcohol." Examples are methyl alcohol, ethyl alcohol, and tert-butyl alcohol. Propyl alcohol would be called n-propyl alcohol, if the hydroxyl group is bonded to the first carbon atom on the propane chain; or isopropyl alcohol, if the hydroxyl group is bonded to the second carbon atom on the propane chain. Isopropyl alcohol is also occasionally called sec-propyl alcohol. In the systematic nomenclature recommended by the International Union of Pure and Applied Chemistry (IUPAC), the name of the alcohol begins with the name of the corresponding alkane chain, but the terminal "e" is replaced by "ol." Examples are "methanol" (for methyl alcohol) and "ethanol" (for ethyl alcohol). When necessary, the position of the hydroxyl group is indicated by a number between the alkane name and the "ol." Examples are propan-1-ol (for n-propyl alcohol or CH3CH2CH2OH) and propan-2-ol (for isopropyl alcohol, CH3CH(OH)CH3). Sometimes, the position number is written before the IUPAC name: 1-propanol and 2-propanol. If a higher priority group is present (such as an aldehyde, ketone or carboxylic acid), then it is necessary to use the prefix "hydroxy." An example is 1-hydroxy-2-propanone (CH3COCH2OH). Alcohols may be subdivided into three major classes: 'primary' (1°), 'secondary' (2°) and 'tertiary' (3°), based upon the number of carbon atoms attached to the carbon in the C-OH group. Methanol is the simplest 'primary' alcohol. The simplest secondary alcohol is isopropyl alcohol (propan-2-ol). A simple tertiary alcohol is tert-butyl alcohol (2-methylpropan-2-ol), consisting of a propane chain with methyl and hydroxyl groups both attached to the middle (#2) carbon. Carbohydrates (sugars) and sugar alcohols are an important class of compounds containing multiple alcohol functional groups and may be called polyols. For example, sucrose (common sugar) contains eight hydroxyl groups per molecule and sorbitol has six. Most of the attributes of these polyols—such as nomenclature, occurrence, use, and toxicity—sufficiently differ from simple aliphatic alcohols to require separate treatment. The phenols, named after the parent compound phenol, also have a hydroxyl group, but it is attached to an aromatic ring (usually benzene), not an aliphatic chain. As a result, their properties are very different and they are treated separately. The hydroxyl group generally makes the alcohol molecule polar. Those groups can form hydrogen bonds to one another and to other compounds. This hydrogen bonding means that alcohols can be used as protic solvents. Two opposing solubility trends in alcohols are: the tendency of the polar OH to promote solubility in water, and of the carbon chain to resist it. Thus, methanol, ethanol, and propanol are miscible in water because the hydroxyl group wins out over the short carbon chain. Butanol, with a four-carbon chain, is moderately soluble because of a balance between the two trends. Alcohols of five or more carbons (Pentanol and higher) are effectively insoluble in water because of the hydrocarbon chain's dominance. All simple alcohols are miscible in organic solvents. Because of hydrogen bonding, alcohols tend to have higher boiling points than comparable hydrocarbons and ethers. 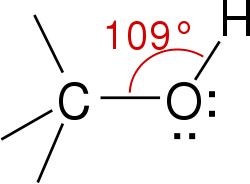 The boiling point of the alcohol ethanol is 78.29 °C, compared to 69 °C for the hydrocarbon Hexane (a common constituent of gasoline), and 34.6 °C for Diethyl ether. Alcohols, like water, can show either acidic or basic properties at the O-H group. With a pKa of around 16-19 they are generally slightly weaker acids than water, but they are still able to react with strong bases such as sodium hydride or reactive metals such as sodium. The salts that result are called alkoxides, with the general formula RO- M+. Alcohols can also undergo oxidation to give aldehydes, ketones or carboxylic acids, or they can be dehydrated to alkenes. They can react to form ester compounds, and they can (if activated first) undergo nucleophilic substitution reactions. The lone pairs of electrons on the oxygen of the hydroxyl group also makes alcohols nucleophiles. For more details see the reactions of alcohols section below. Alcohol is often used as an automotive fuel. Ethanol and methanol can be made to burn more cleanly than gasoline or diesel. Alcohol was once used as an antifreeze in automobile radiators. To add to an internal combustion engine's performance, methanol may be injected into turbocharged and supercharged engines. This cools the air intake charge, providing a denser air charge. Alcohols have applications in industry and science as reagents or solvents. Because of its low toxicity and ability to dissolve non-polar substances, ethanol can be used as a solvent in medical drugs, perfumes, and vegetable essences such as vanilla. 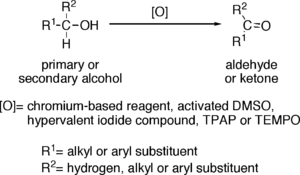 In organic synthesis, alcohols serve as versatile intermediates. Ethanol can be used as an antiseptic to disinfect the skin before injections are given, often along with iodine. Ethanol-based soaps are becoming common in restaurants and are convenient because they do not require drying due to the volatility of the compound. Alcohol is also used as a preservative for specimens. Alcohols often have an odor described as 'biting' that 'hangs' in the nasal passages. Ethanol in the form of alcoholic beverages has been consumed by humans since pre-historic times, for a variety of hygienic, dietary, medicinal, religious, and recreational reasons. The consumption of large doses result in drunkenness or intoxication (which may lead to a hangover as the effect wears off) and, depending on the dose and regularity of use, can cause acute respiratory failure or death and with chronic use has medical repercussions. Because alcohol impairs judgment, it can often be a catalyst for reckless or irresponsible behavior. The LD50 of ethanol in rats is 11,300 mg/kg. This ratio would correspond to an 80kg (176.4lb) man drinking 65 shots of 80 proof alcohol, although the LD50 does not necessarily translate directly to humans. A more accurate but less precise figure would estimate the LD50 of the same 80kg (176.4lb) at about 15.5 shots of 80 proof alcohol. Other alcohols are substantially more poisonous than ethanol, partly because they take much longer to be metabolized, and often their metabolism produces even more toxic substances. Methanol, or wood alcohol, for instance, is oxidized by alcohol dehydrogenase enzymes in the liver to the poisonous formaldehyde, which can cause blindness or death. An effective treatment to prevent formaldehyde toxicity after methanol ingestion is to administer ethanol. Alcohol dehydrogenase has a higher affinity for ethanol, thus preventing methanol from binding and acting as a substrate. Any remaining methanol will then have time to be excreted through the kidneys. Remaining formaldehyde will be converted to formic acid and excreted. Many alcohols can be created by fermentation of fruits or grains with yeast, but only ethanol is commercially produced this way—chiefly for fuel and drink. Other alcohols are generally produced by synthetic routes from natural gas, petroleum, or coal feed stocks; for example, via acid catalyzed hydration of alkenes. For more details see Preparation of alcohols. Several methods exist for the preparation of alcohols in the laboratory. Primary alkyl halides react with aqueous NaOH or KOH mainly to primary alcohols in nucleophilic aliphatic substitution. (Secondary and especially tertiary alkyl halides will give the elimination (alkene) product instead). Aldehydes or ketones are reduced with sodium borohydride or lithium aluminium hydride (after an acidic workup). Another reduction by aluminumisopropylates is the Meerwein-Ponndorf-Verley reduction. Alkenes engage in an acid catalysed hydration reaction using concentrated sulfuric acid as a catalyst which gives usually secondary or tertiary alcohols. The hydroboration-oxidation and oxymercuration-reduction of alkenes are more reliable in organic synthesis. By fermentation using glucose produced from sugar from the hydrolysis of starch, in the presence of yeast and temperature of less than 37°C to produce ethanol. For instance the conversion of invertase to glucose and fructose or the conversion of glucose to zymase and ethanol. By direct hydration using ethane or other alkenes from cracking of fractions of distilled crude oil. Uses a catalyst of phosphoric acid under high temperature and pressure of 50-120. Methanol is produced from water gas: It is manufactured from synthesis gas, where carbon monoxide and two equivalents of hydrogen gas are combined to produce methanol using a copper, zinc oxide and aluminum oxide catalyst at 250°C and a pressure of 50-100 atm. Alcohols can behave as weak acids, undergoing deprotonation. The deprotonation reaction to produce an alkoxide salt is either performed with a strong base such as sodium hydride or n-butyllithium, or with sodium or potassium metal. It should be noted, though, that the bases used to deprotonate alcohols are strong themselves. The bases used and the alkoxides created are both highly moisture sensitive chemical reagents. The acidity of alcohols is also affected by the overall stability of the alkoxide ion. Electron-withdrawing groups attached to the carbon containing the hydroxyl group will serve to stabilize the alkoxide when formed, thus resulting in greater acidity. On the other hand, the presence of electron-donating group will result in a less stable alkoxide ion formed. This will result in a scenario whereby the unstable alkoxide ion formed will tend to accept a proton to reform the original alcohol. With alkyl halides alkoxides give rise to ethers in the Williamson ether synthesis. The OH group is not a good leaving group in nucleophilic substitution reactions, so neutral alcohols do not react in such reactions. However if the oxygen is first protonated to give R−OH2+, the leaving group (water) is much more stable, and nucleophilic substitution can take place. For instance, tertiary alcohols react with hydrochloric acid to produce tertiary alkyl halides, where the hydroxyl group is replaced by a chlorine atom. If primary or secondary alcohols are to be reacted with hydrochloric acid, an activator such as zinc chloride is needed. Alternatively the conversion may be performed directly using thionyl chloride. Alcohols are themselves nucleophilic, so R−OH2+ can react with ROH to produce ethers and water in a dehydration reaction, although this reaction is rarely used except in the manufacture of diethyl ether. More useful is the E1 elimination reaction of alcohols to produce alkenes. The reaction generally obeys Zaitsev's Rule, which states that the most stable (usually the most substituted) alkene is formed. Tertiary alcohols eliminate easily at just above room temperature, but primary alcohols require a higher temperature. A more controlled elimination reaction is the Chugaev elimination with carbon disulfide and iodomethane. In order to drive the equilibrium to the right and produce a good yield of ester, water is usually removed, either by an excess of H2SO4 or by using a Dean-Stark apparatus. Esters may also be prepared by reaction of the alcohol with an acid chloride in the presence of a base such as pyridine. Other types of ester are prepared similarly- for example tosyl (tosylate) esters are made by reaction of the alcohol with p-toluenesulfonyl chloride in pyridine. Primary alcohols (R-CH2-OH) can be oxidized either to aldehydes (R-CHO) or to carboxylic acids (R-CO2H), while the oxidation of secondary alcohols (R1R²CH-OH) normally terminates at the ketone (R1R²C=O) stage. Tertiary alcohols (R1R²R³C-OH) are resistant to oxidation. Often it is possible to interrupt the oxidation of a primary alcohol at the aldehyde level by performing the reaction in absence of water, so that no aldehyde hydrate can be formed. Chromium-based reagents, such as Collins reagent (CrO3·Py2), PDC or PCC. Activated DMSO, resulting from reaction of DMSO with electrophiles, such as oxalyl chloride (Swern oxidation), a carbodiimide (Pfitzner-Moffatt oxidation) or the complex SO3·Py (Parikh-Doering oxidation). Hypervalent iodine compounds, such as Dess-Martin periodinane or 2-Iodoxybenzoic acid. Catalytic TPAP in presence of excess of NMO (Ley oxidation). Catalytic TEMPO in presence of excess bleach (NaOCl) (Anelli’s oxidation). Allylic and benzylic alcohols can be oxidized in presence of other alcohols using certain selective oxidants such as manganese dioxide (MnO2). Reagents useful for the oxidation of secondary alcohols to ketones, but normally inefficient for oxidation of primary alcohols to aldehydes, include chromium trioxide (CrO3) in a mixture of sulfuric acid and acetone (Jones oxidation) and certain ketones, such as cyclohexanone, in the presence of aluminium isopropoxide (Oppenauer oxidation). Alcohols possessing two hydroxy groups located on adjacent carbons—that is, 1,2-diols—suffer oxidative breakage at a carbon-carbon bond with some oxidants such as sodium periodate (NaIO4) or lead tetraacetate (Pb(OAc)4), resulting in generation of two carbonyl groups. ↑ Philippus Aureolus Paracelsus,  The Free Encyclopedia by Farlex. Retrieved September 10, 2007. ↑ Robert S. Gable, 2003. Comparison of acute lethal toxicity of commonly abused psychoactive substances. Retrieved September 10, 2007. ↑ John Brick, 2003. Alcohol Overdose. Rutgers Center of Alcohol Studies. Retrieved September 10, 2007. Solomons, T. W. Graham, and Craig B. Fryhle, 2004. Organic Chemistry. 8th ed. Hoboken, NJ: John Wiley. ISBN 0471417998. This page was last modified on 18 February 2019, at 21:20.